CS-TBZ FOR SALE: Original Verkuyl 1960s metal 1/50th scale model. No stand. $2000. Add $200 for Lockheed style base if required. 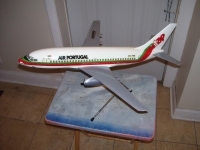 CS-TBZ FOR SALE: ORIGINAL 1960s METAL MODEL BY VERKUYL .. MODEL COMES WITH WINGS AND ORIGINAL STAND.